miss~nances life: How many UFO's do you have????? How many UFO's do you have????? I have way toooooo many. 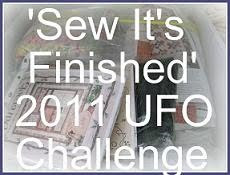 So I have decided to join the Sew it's finished UFO challenge over at Sew it's finished blog. I have sent off my looooooooong list of UFO's but have decided to also post them on here to keep me honest. I am too scared to look any closer as I am sure there will be others.